Manufacturer of a wide range of products which include nail machine equipment. The Cutting tools of the nail making Machines become blunt and they require re-girding. We have developed a special Cutter Grinder for grinding all the profiles of cutters. 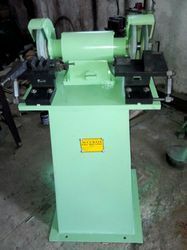 These machines are provided with the special type of jigs and fixtures so that even a semi-skilled worker can grind (re-sharpen) the cutting tools easily after a short training. Looking for Nail Machine Cutter Grinder ?